The story of the 27 club is a one of brilliance: precious, fragile, and amazing to behold. Six musical artists who all happened to die at the same early age—27—did more than perform memorable songs: They expressed ideas and emotions that were shared by enthralled followers from their generations and beyond. The stories of these luminous artist lead to tragic ends. But the lives they led were transformative—to music, to culture, and to countless lives. 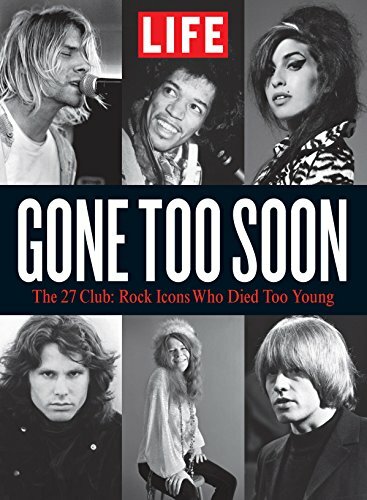 In Gone Too Soon: The 27 Club, LIFE pulls you into the brief and explosive lives of musicians Brian Jones, Jimi Hendrix, Janis Joplin, Jim Morrison, Kurt Cobain, and Amy Winehouse through photographs and interviews. Read how Hendrix uniquely mashed together blues and rock into a paisley-patterned kaleidoscope of sound, look at images of Cobain’s infamous MTV Unplugged special and much more. The legacy of these artists still lives and breathes onstage, embodied by musicians who looked to these icons for inspiration.